What Does the Future Hold for New York’s Columbus Statue? It may remain up for now, but the Left is playing the long game. It looks like Christopher Columbus can stay put. For now. 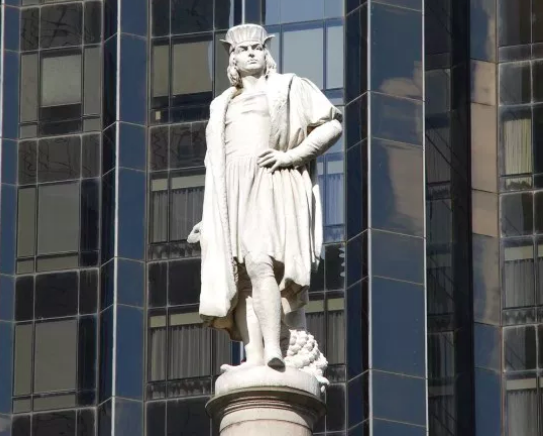 Earlier this month, New York City’s Advisory Commission on City Art, Monuments, and Markers announced that the 76-foot monument to Columbus can remain at the traffic circle at the southwest corner of Central Park, despite protests from groups claiming to speak for Native Americans. For both Italian Americans, who view Columbus as a symbol of ethnic pride, and Latinos, whose culture was born from the Spanish colonization ushered in by Columbus, the decision comes as a relief. But the commission’s report is not all good news. A close review reveals the precarious place of Columbus, and other historic figures, in today’s culture of grievance. But this didn’t stop de Blasio from flaunting his Italian heritage by marching in the annual Columbus Day parade in October. Apparently, de Blasio, who was born Warren Wilhelm Jr. but now uses his mother’s maiden name (for obvious political reasons), wants to have things both ways: to cultivate the good will of Italian Americans while simultaneously stoking his radical-progressive base. The commission’s 42-page report, released January 11, is equally brazen. Although it ultimately recommends keeping three of the four memorials it reviews, the report is so filled with predictable drivel about the need for an “intersectional” approach to honoring previously “erased” cultures that it reads more like an ideological manifesto than a blueprint for dealing with public monuments. Right from the start, the document frames the commission’s mandate in grandiose terms: to evaluate monuments and markers on city property that “may be viewed as inconsistent with the values of New York City.” Viewed as inconsistent by whom? The report does not say, but presumably this use of the passive voice is intended to point to the commission’s 18 wise and enlightened members, who are uniquely qualified to identify all things offensive. And it developed an online survey, which received more than 3,000 responses. Although the data were then analyzed, at taxpayer expense, by an independent consultant, the report itself makes no mention of the findings (which can be accessed only by hyperlink from one of the report’s appendices and here). In their logic, it follows that New York must pay for the trauma its statues inflict on an almost daily basis with “equity funds for historically underrepresented communities,” “tangible community investments,” and the creation of “an interagency task force on monuments to deal with this issue moving forward.” Let’s unpack that, shall we? The city should pay off the aggrieved and create a permanent commission to continue indefinitely the great monument inquisition. As for Columbus, the great navigator can stay, but only if the city provides “context.” More specifically, the report calls for explanatory markers, the construction of new monuments to indigenous tribes (which tribes it does not say), Native American art exhibits, the creation of a city-wide Indigenous People’s Day (possibly to replace Columbus Day), and a “literacy” campaign to educate New Yorkers about the negative consequences of the European colonization of the Americas. Inevitably, this “literacy” campaign will be one-sided and is likely to reflect the Marxist view that Columbus ushered in the era of exploitative capitalism, characterized by “the extirpation, enslavement and entombment” of the native population. Does anybody really think the proposed educational materials will also include the viewpoints of mainstream historians that Columbus was a man ahead of his time who did what he could to restrain the bad behavior of others? Of course not. In the end, the move to “contextualize” monuments is not really about history, it’s about politics. In this sense, anti-Columbus iconoclasts are playing the long game: buying time to re-educate the public in the hope that New Yorkers eventually embrace a “different point of view” on European colonization, one that makes removing Columbus more politically practical. Although the commission claims that its goal is “to make strides toward truth-telling toward the eventual goal of reconciliation,” those who seek to relegate Columbus to the dust heap of history are interested in neither truth nor reconciliation. Their short-term goal is to extract reparations from the city; their long-term goals are to bend the public to their will and recast the history of this country (and Western civilization generally) in a critical and misleading light. Ayanna Pressley thinks your 16-year-old should be able to vote. Let that sink in a minute. Who’s Afraid of Neomi Rao? Helen Brady on Rock, Paper, Scissors (Part IV): Which 2016 GOP candidate can beat Hillary? Copyright 2019 Jennifer C. Braceras.